Mick McCarthy is set to intensify his pursuit of Nathan Redmond as the Southampton attacker mulls over his international future. Birmingham-born, the 24-year-old has represented England at every level, including a senior friendly last year against Germany, but has the option of switching allegiance. Redmond's Irish connections are in Dublin through his mother Michelle Redmond, who raised her three children alone. McCarthy, appointed to the Ireland position last month for a second time, confirmed over the weekend his intention to speak with a number of dual-eligible players. It's understood Redmond is amenable to a discussion. It may help McCarthy's cause that his former Ireland team-mate Chris Hughton is close to the player and his family. Redmond thrived under Hughton at his first club, Birmingham City, and was lured to Norwich City by the Irishman in 2013. Two years later, he spoke of his international career, admitting he remained undecided about the country he would ultimately represent. "When the time comes to play senior international football, I'll have to decide between England, Jamaica and the Republic of Ireland," he said. Redmond has made 21 appearances this season for the Saints, bagging his first goal of the term in Saturday's win over Huddersfield Town. 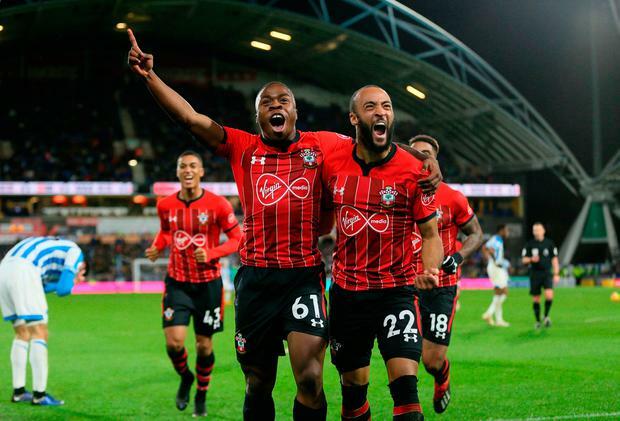 His cross also allowed Michael Obafemi get off the mark for the season and the Ireland international afterwards hailed the influence of Redmond in his development. For Redmond to be eligible for the opening matches of McCarthy's reign, the Euro 2020 qualification double-header against Gibraltar and Georgia in May, he'd need to submit a transfer request to FIFA in the next fortnight. McCarthy would relish the opportunity of pairing Saints duo Obafemi and Redmond in attack during his sole campaign that will entail at least eight qualifiers and two friendlies. "It might be that Michael Obafemi turns out to be the next Robbie Keane," McCarthy said of the 18-year-old pushing for a start in tomorrow's visit of West Ham United. "Michael is playing in the Premier League and scoring goals. He deserves that it will ultimately benefit Ireland. As his manager, I'm never too unhappy to have someone who can run in behind to stretch defences."